Discussion in 'Fiddleback Forge Knives' started by Bmurray, Feb 10, 2019. In large pot over medium heat add remaining oil and add flour (roux). Whisk until desired color is achieved and don’t stop whisking or the flour will burn. I like a really dark brown color. Add seafood stock, tomatoes, and previously sautéed veggie/spice mix. Reduce heat to low and cook for approx. 15 minutes. Add sausage, shrimp, and crawfish. Cook 5 minutes or until the shrimp done. Add frozen okra and corn starch mix and continue cooking until desired thickness. Cook rice as instructed on the box. 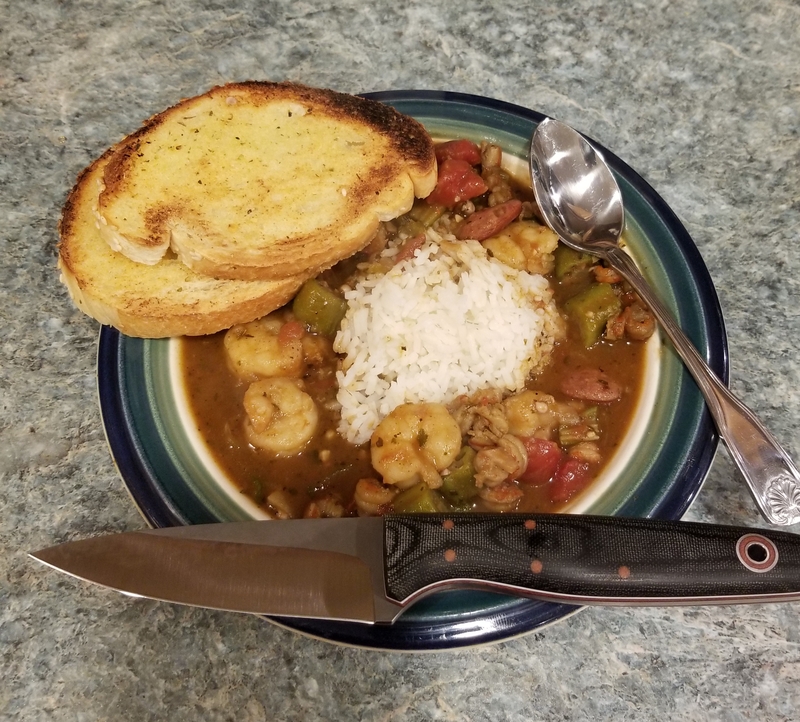 Serve in bowl with a scoop of rice in the center and spoon in gumbo around the outside. - Taste before meat is added and add more Tony’s creole seasoning for personal taste. - Add a bag of frozen sweet corn for a nice twist. - You can also add seasoned grilled chicken if desired. PolRoger, schmittie, Odaon and 2 others like this.